A phone call last week jolted me into reality, letting me know that my security clearance has come through and I will begin work in two weeks. I was giddy the rest of the day - so excited to begin this job, so anxious about sorting out my work-life balance, and so aware that I only have two weeks left to explore this town at my leisure! Luckily, I had plans to meet my friend Johanna at Yoga House for yoga and lunch - all three items which would be on my final bucket list. The spot was charming, the yoga was challenging, and the company was fabulous. After I calmed down, I spent a few days crafting my bucket list. What does one do with the last two weeks of flexible time in a new city? Well, I've got a lot of shopping to do - I would love to finish settling in to the house without using family time to shop. Happily, the rest of my list is significantly less shallow. I've been well aware that Mumbai tastes both delicious and fattening, and that I'll struggle to fit in regular workouts once I begin work. I've been making a habit of hitting the cardio downstairs three times a week, and attending either yoga or pilates twice a week. Those are now set in stone for the next two weeks. Its been lovely to know that I had a job beginning soon, because it forced me to dive into anything outside of work head first. When I met someone interesting, I hooked up for coffee again within a week. When invited to something at school, I almost always joined in. I built my network quickly and with great joy, and now its time to focus. There are a few folks I really hope to have some quality time with before my days disappear into the consulate. If you'll receive an Indian made Christmas gift from me, I need to purchase it and put it in the mail within the next two weeks. My spare time will decrease just as the holidays ramp up, and it'll be best to cross the actual Christmas shopping off the to do list early. Also, mail from across the world can be slow at best - that is to say, I may be on time rather than early. There are a few things already on the calendar and a few small errands I've been putting off which will complete the list. Lets see how intentional I can be with these next two weeks. I've been telling you that Mumbai is a city full of hidden treasures. Over the past few weeks, I have been lucky enough to stumble upon a number of them. I spent Monday morning making my first rangoli - check out the video on Facebook. I spent the afternoon in the small dress shop that made my sari. My housekeeper came along because she will wind the sari around my body when I wear it to the Marine Ball next week. I love entering this shop. The walls are lined with folded dresses which they'll whip out and lay across the counter in gorgeous piles at any expression of interest. My sari fit perfectly, my housekeeper schooled both myself and the staff in the shop on best sari practice, and the entire afternoon was loads of fun. As they ran my credit card through the machine, I chatted with the shop owner about the Mumbai Film Festival, which she loves. She explained that she is particularly excited about this year's festival because she designed and created the costumes for one of the entries. She went on to say that the film would premiere the following day and invited me along. One simply can not refuse such an invitation, and so I screened Mango Dreams with the Costume Designer at the Mumbai Film Festival. The entire afternoon was amazing and surprising, from the company I kept to the Q&A with the actors and director after the film. The week grew less glamorous but no less exciting. There was more shopping, this time for simple black cloth to decorate our car for the Halloween Trunk or Treat at the consulate this evening. Anything that would be a quick trip to Michael's in America tends to be an exciting excursion when in another country, and the search for black cloth in Mumbai was no different. After navigating a hallway too thin for both myself and my purse, I found myself at a little stand with bolts of fabric lining the side and full, blue plastic bags lining the back wall. When I asked for cheap black fabric, he grabbed something rather thick but fairly sparkly. Nt bad for masking a white car, but the price was not right. At 150 rupees per meter, I asked if he had anything cheaper. This is when he pulled himself up through a hole in the ceiling. I had to include the picture, even though I snapped it far too quickly. He had climbed on top of the desk, stepped up a few shelves, and then hoisted himself into the crawl space before I had the chance to grab my camera. He rummaged through the attic to find black material which draped easily and eventually fell to $0.75 per meter. My week full of riches began with rangoli and finished with Halloween, although as I write I am listening to Diwali fireworks out my windows. It is a richly multi-cultural life we lead here, and our Halloween party was no different. My trunk was masked neatly in black cloth and covered with orange and black streamers. Loads of kids came by with varying levels of trick or treating proficiency. Many needed lessons on how to get candy on Halloween - not by saying please, but by hollering Trick or Treat! One child simply could not understand my demand, and his mother began prompting him - She is saying take a treat! I have been so blessed over the past week to have a new window into my city nearly every day. I attended a ladies group at the pastor's house on Thursday and enjoyed a morning in a beautifully renovated old home down a tiny lane, reminiscent of the lane houses in Shanghai. Each woman was lovely, and the food and the conversation were absolutely worthwhile. But so too was the chance to spend time with people outside my normal expat circle of the consulate and the school. I went shopping for the Marine Ball with a few friends on Friday. We looked at saris, lehengas, and gowns. The embroidery, the brocade, the crystals and mirrors artfully covering these unique pieces were stunning. We observed Columbus Day, Navratri, and Dussehra earlier this week by watching late night dancing in the streets. Bank holidays in either India or the United States are consulate holidays as well, so Dave and I took the opportunity to check out some new parts of town. There were school events, workshops teaching me approaches to literacy, and maker spaces where my children used a vast array of bits and pieces to create a vast array of things - a potion for Halloween, a wagon which could pull all three of them, and a table complete with money box for selling baked goods. Their imaginations went wild. Also, Lilly and I had the opportunity to walk through Dhobi Ghat and then meet some dabba wallas, two of Bombay's most unique activities. We went on a sun-filled morning with a fascinating guide and a camera for each of us. Dhobi Ghat is the largest outdoor laundry in the world. People have been washing the city's clothes here for over 140 years, in exactly the same buildings and tubs. If your shirt says Made in India, then it likely received its pre-wash at Dhobi Ghat. This website offers a great summary of this remarkable place, but takes a much darker view of the enterprise than our guide, who focused on the ingenuity, creativity, and strong heritage embodied by the many people hard at work within Dhobi Ghat. Many name brands send their clothes to Dhobi Ghat to be pre-washed, distressed in the dryers, or neatly pressed for shipping. The workers in Dhobi Ghat spend a lot of time in the water, and cover themselves in coconut oil at the end of every day to protect their skin. Washing the city's clothes requires tremendous shoulder strength, both for flogging the clothes in the tubs and for hanging them overhead. Clothespins costs many and don't last very long. 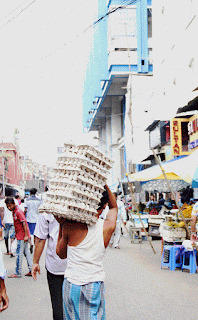 The people of Dhobi Ghat excel at economy, not using anything they do not need. And why invest in a new iron when the old coal model still works just fine? The dabba walas, also unique to Mumbai, deliver home cooked food from a student or worker's home to their school or office across the city through a very intricate but essentially simple process. They have been studied by Harvard Business School, Forbes Magazine, and numerous Fortune 500 companies for their efficiency practices, yet most of the dabba walas are illiterate and have no management practices outside of their work. Follow the links above for more information, because the process is fascinating, and because this is Lilly's new career plan - to be paid for riding her bike would be a dream come true. In Darjeeling, we spent an evening in a bookstore. The shelves were crowded and appeared disorganized, with many books in piles, some appearing quite worn. But as I walked through, I began noticing titles I have loved to read, and titles on my list to read soon. With the realization that I quite liked the buyers, the shop changed from disorganized to charmingly cluttered and the stacks called to me to dig through them. And dig we did. We are enjoying so many things in India, but one breath of fresh air for us has been language. We speak no Hindi, but neither do many other Indians. India is a nation of languages. A quick google search showed that India has 22 official languages, and the cited number of mother tongues varies from 438 to 1,652. Over the years, I have grown comfortable not understanding the conversations swirling around me on the street, but now I am loving having the chance to approach a stranger for help. Likewise, I loved entering this bookshop and finding it well stocked with Indian authors. 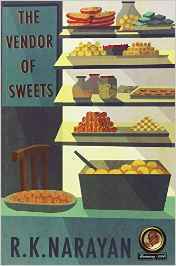 I often judge a book by its cover, and so I picked up The Vendor of Sweets that evening and read it on the airplane journey home the next day. It was a quick and easy read and opened up a world that I have never seen anywhere else - a simple story told from an Indian author to an Indian audience. Reading about a country is fascinating, but reading within the country, by and for the country, was a real treat. I won't spend any time on analysis. It is on my shelf if you'd like to read it, but I won't suggest you seek it out. However, I am much encouraged to begin grabbing books off of the shelves in bookstores around the country. This new window into this culture is such a joy. I felt disappointed in Darjeeling while we were there, because our experience so contrasted with my expectations. I expected a pastoral village tucked into the sunshine mountains. Darjeeling is no pastoral village. Rather, it is a rural city in a developing country, nestled among beautiful mountains. As in Mumbai and Calcutta, the heritage buildings are lovely and contribute to a particularly interesting story. But those heritage buildings cry out for maintenance and the new city lacks beauty. Also disappointingly, I expected cool, crisp weather but spent my days damp and dodging raindrops. Still, as I processed the photos, I was reminded of the many points of beauty contained in this one small area. The city sits so high in the mountains that the clouds lay close upon you and envelope your very body, often burying themselves between the folds of the hills. The city is known for its schools, and every afternoon saw young learners in their uniforms wandering their way home from school. Darjeeling has the only zoo in the Himalayan ecosystem and boasts many animals in their natural habitat. Lilly has been chasing wolves since this summer in Yellowstone, and enjoyed watching this Tibetan wolf. Darjeeling is home to a large diaspora of Tibetan refugees, and brightly colored prayer flags cover the town. The city boasts a view of Kangchenjunga, the third highest mountain in the world. And then there was the tea, which we drank all day long, in our guesthouse, on the lawn, at cafes, and along the road. We tasted a different local tea with every cup. We drank with sugar but not milk, because Darjeeling is not like the rest of India. We watched people plucking the tea, drying the tea, and sorting the tea. And every step contained beauty. We spent a few days in Calcutta over our September holiday. There were so many things to see and to experience, so I'll just share the photos with you rather than any stories. On one of our walks, we stopped for tea from a streetside chaiwallah. In Calcutta, they serve the street chai in clay cups which you smash after you've drunk them. They explained that the boiling tea in the disposable clay cup is free from any bacteria. This chaiwallah spikes his tea with strong coffee - Sophia was a big fan. September and October are the height of festival season in the Indian calendar. Loud music pulses from the streets surrounding our home as I'm writing. We had missed an actual immersion of Ganesh while we were in Mumbai, but we did witness local people in Calcutta immersing their god of infrastructure. The parade and the immersion was quite social and had a very celebratory nature. The watched the immersions just upriver from one of Calcutta's many bridges, along a riverwalk quite popular with young lovers. 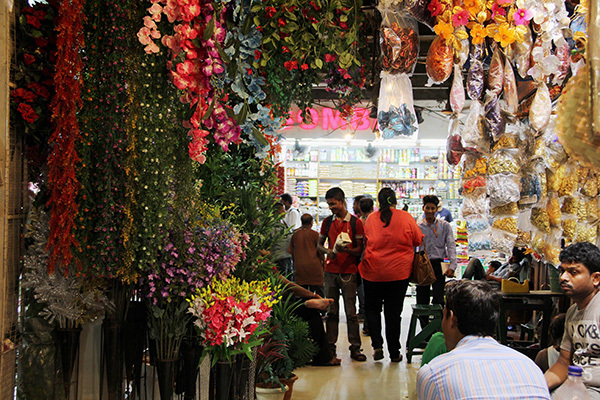 Calcutta's New Market is another city landmark, and sells an amazing assortment of items. 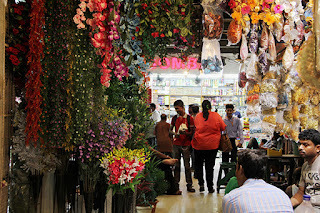 From dry goods featuring colorful jars of spices and bright buckets of lentils and legumes, through a cavernous butcher hall, and to a range of flower stalls, jewelry shops and bakeries. To be quite honest, I found the city a bit overwhelming. We explored with guides every day, which helped us to see the beauty, the heritage, and the remarkable around every turn. This left me wondering if any of those would have risen to the surface had we tried to explore on our own. That Calcutta would be difficult for a novice to explore on foot should not label the city, but it certainly colors my memories.